A mindless anti-buddy action flick, Bullet To The Head is a throwback to another era and offers little to suggest that the memories are worth saving. In New Orleans, hitman James Bonomo (Sylvester Stallone) and his partner Louis Blanchard successfully kill their target Hank Greely, an ex-cop turned criminal. But they are double crossed and Blanchard is knifed to death, while Bonomo barely escapes the clutches of brutal assassin Keegan (Jason Momoa). Washington DC detective Taylor Kwon (Sung Kang) arrives in town to investigate the murder of Greely, his former partner. Bonomo and Kwon form an uneasy alliance to track down the mastermind behind all the killings, with Kwon insisting on due process while Bonomo is more inclined to shoot his way to quick solutions. Bonomo's daughter Lisa (Sarah Shahi), a tattoo artist, provides some help and catches Kwon's eye. The unlikely partners dodge murderous crooked cops on the way to confronting sleazy middle man Ronnie Earl, crooked lawyer Marcus Baptiste (Christian Slater) and corrupt businessman Robert Nkomo Morel (Adewale Akinnuoye-Agbaje). Director Walter Hill (age: 70) and Sylvester Stallone (age: 65) attempt to turn back the clock to their glory action film era from 30 years ago, and fail. Bullet To The Head, an adaptation of a French graphic novel, is squarely aimed at the undiscerning subcomponent of the international market, but even with Kang added to boost appeal in Asia, all audiences knew enough to steer clear. It's easy to see why. 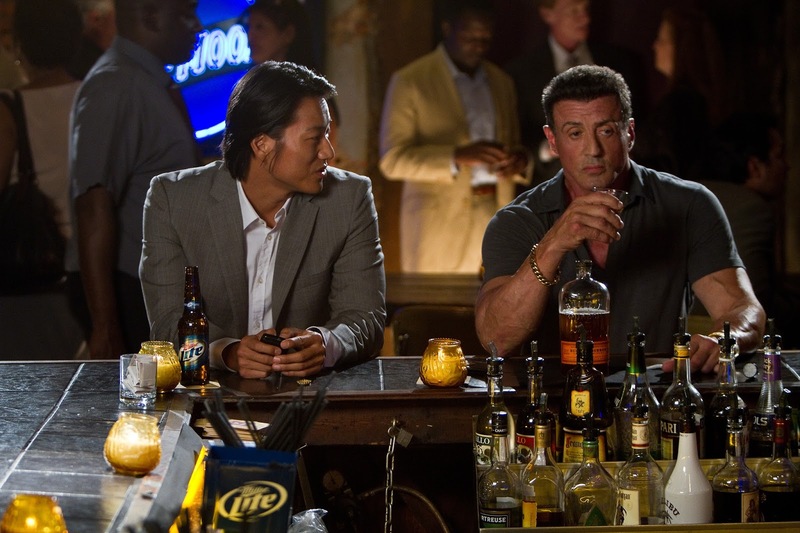 Despite Hill introducing stylistic touches and Stallone delivering dry one-liners, the film is entirely constructed of recycled and tired old components long since exhausted. The banter between Bonomo and Kwon is lifted from the 1980s and numerous opposites-but-partners-in-the-car buddy movies. Kwon wants to question and interrogate, Bonomo wants to threaten and intimidate, and it's clear early which method will always prevail. The action scenes are slightly better, but are lined up with sequential set-piece discipline, Bonomo predictably knocking-off his opponents with mechanical efficiency. As far as the detective work is concerned, the film starts and ends with Kwon making phone calls to his DC headquarters whenever he needs to locate anyone, and within seconds receives the information needed to pinpoint the exact current location of the intended target. Bullet To The Head sorely needed a dose of its own medicine before it ever jumped onto the screen.